Specialist dry powder fire extinguishers are designed specifically to aid in the tackling of Class D fires. Class D fires are blazes that contain metals including sodium, magnesium and aluminium swarf or turnings. 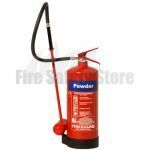 Here at Fire Safety Store we offer a 9kg M28 dry powder extinguisher that is highly effective against fires in the form of metal powder or swarf. It should be noted however, our specialist dry powder fire extinguishers do not cover lithium based blazes. Environments such as laboratories and workshops where metal is most prevalent are most at risk from Class D fires and appropriate measures should be taken in preparation for such blazes. Specialist dry powder fire extinguishers are the only extinguishers that are recommended to be used for Class D fires. These extinguishers are somewhat unique in design as they serve a very specific requirement. They have a specialised low velocity lance-like applicator which enables the contents to gently fall onto the fire and prevent burning metal swarf and powder from spreading further from the initial burn site. It also makes use of special swivel joint on the hose for easier handling, control and navigation. This is especially vital in labs and workshops where metals are readily used and present throughout the workplace. Dry powder within canisters cools fire down and in turn takes away the heat that a blaze needs to thrive. Without sufficient heat, chemical reactions which help the spread of fire are slowed down and the blaze is unable to grow. All M28 extinguishers supplied by Fire Safety Store come filled and ready to use if called upon and have a lifespan of 10 years. There is also an easy to use and read gauge attached to quickly indicate content levels to inspectors. Fire extinguishers have to be easily identifiable in case of emergency. This is achieved by the classic red body and a label of 5% of the total size of the extinguisher with a colour coded indication of the contents. Specialist dry powder fire extinguishers, just like standard dry powder canisters, must show a blue label according to British Standards regulations. Although dry powder extinguishers are recognised for their ability to effectively and efficiently tackle a range of fire types, specialist varieties should generally only be used on Class D fires. They do contain the same contents but have been manufactured solely to focus on a particular fire class. Dry powder extinguishers should never be used in enclosed spaces. When triggered, the firefighting agent which helps to slow down the acceleration of fire emits a cloud which can obscure vision and prevent safe evacuation if escapees cannot see properly. Place your order before 2pm and you will be eligible for next day delivery. To find out more about specialist dry powder fire extinguishers or any of our products, do not hesitate to call us free of charge on 0800 3160890 and we will gladly take any questions you may have.